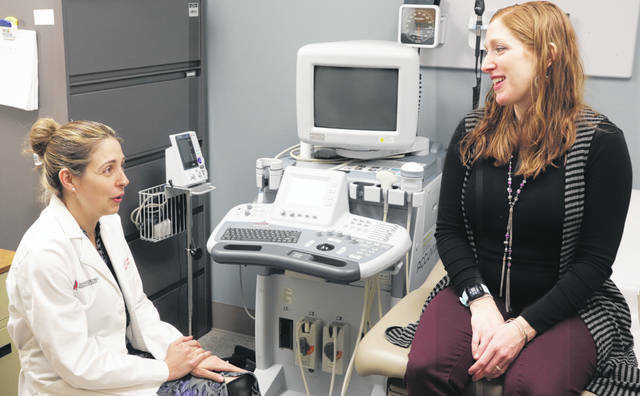 Dr. Kara Rood speaks with a pregnant woman during a prenatal visit at The Ohio State University Wexner Medical Center. Dr. Rood led a study to test a fast and easy test to diagnose preeclampsia, a condition that can be fatal to mom and baby if not diagnosed and treated quickly. COLUMBUS — Researchers with The Ohio State University College of Medicine, The Ohio State University Wexner Medical Center and Nationwide Children’s Hospital have found that a simple urine test can rapidly detect one of the world’s deadliest pregnancy-related conditions at the point of care. This could have a major impact on the health of pregnant women worldwide. In the study, researchers enrolled 346 pregnant women who were being evaluated for high blood pressure and possible preeclampsia. They used the CRD urine test which provides results at the bedside within three minutes. Trained clinical research nurses analyzed results before the patient’s doctor made a final diagnosis. Results of the CRD test were not shared with the patient’s care team. rapid diagnosis of preeclampsia, Rood said. If undetected, preeclampsia can lead to eclampsia, one of the top five causes of maternal and infant illness – including seizures and coma – and the cause of 13 percent of maternal deaths globally. Pregnant women may be induced and unborn children delivered early, even if there’s just suspicion of preeclampsia. Premature birth is also a concern because it increases the risk of learning disabilities, cerebral palsy and blindness in newborns. Rood says in addition to clinicians using this test during prenatal appointments, she also sees this as an easy tool for pregnant women in underdeveloped countries where there’s a lack of resources available. Saving Lives at Birth Partners, the Bill and Melinda Gates Foundation, the government of Norway, Grand Challenges Canada, the United Kingdom’s Department for International Development and the Eunice Kennedy Shriver National Institute of Child Health and Human Development helped fund this research. https://www.delgazette.com/wp-content/uploads/sites/40/2019/03/web1_1-exam1.jpgDr. Kara Rood speaks with a pregnant woman during a prenatal visit at The Ohio State University Wexner Medical Center. Dr. Rood led a study to test a fast and easy test to diagnose preeclampsia, a condition that can be fatal to mom and baby if not diagnosed and treated quickly.